This year at GESS, we were delighted to have School Radio legend and award-winning broadcaster Russell Prue with us on our stand. Russell is extremely popular on the exhibition circuit and has been speaking and presenting at education shows since 1985, so he’s seen many changes in the technology landscape. He has worked at the BBC, RM and Department for Education for England and is a well reported and respected education technology opinion leader. This year we created a new feature for GESS 2017, where we launched NetSupport Radio Dubai. 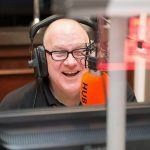 Russell hosted a live radio show every day from our stand X20 at 3pm local time – Dubai (11am GMT), bringing an exciting mix of interviews from highly informed guests, music, chat and much more.